Home » Pages from a Disney Book » Fabulous Disney Pin Boards: Pinterest Contest Results! 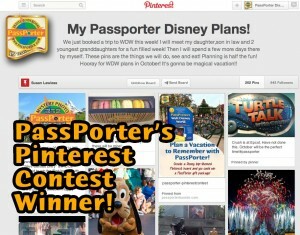 Back in March I proposed a little Pinterest contest for PassPorter. 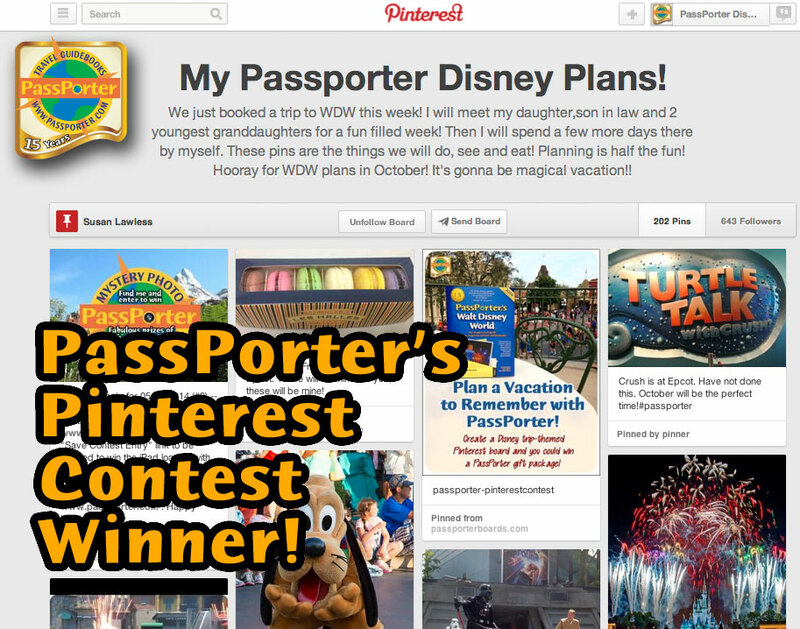 The idea was to have Disney Pinterest fans make a Disney-themed pinboard, include some PassPorter tags and pins, fill it with Disney-related pins, and submit it by May 10. And you all came through brilliantly! I’ve been in Pinterest heaven for the last several days looking through nearly 200 pinboards jam-packed with Disney and travel related pins. Chiradora (42 pins) — I enjoyed Chiradora’s pinboard primarily because of the awesome stick figure family she made to show off her Disney side. Super cute. StephBlovvski (260 pins) — She used the description field (super helpful! ), and I really liked how she made her own pins for remembering tips. RosemondG ( 21) — Great focus on plans for the 2015 Princess Half Marathon! DisneyAC (166) — Excellent collection of Disney-themed pins. KillBunny (51) — I love how many of these pins are new pins, not simply repins (though she certainly has those, too). Jacksmom (505) — Over 500 pins! Wow! I’m impressed with the sheer size of this pin collection! Altchar (29) — And to prove you don’t have a lot of pins to get my attention, this pinboard only has 29 pins (when I checked), but I LOVE the theme of Disney at night. Beautiful photos bring back great memories. IrishSkater425 (95) — It’s ORGANIZED! Unique graphics were pinned and placed carefully to create a lovely showcase. SuellaDaville (202) — This pinboard is impressively large, but I really admired all the personal notes on pins about her interests/hopes/dreams. She’s personalized nearly every pin! I can feel her enthusiasm for Disney in each pin she selected here. She also used a description on her pinboard very effectively and met all our rules. This is a really great use of Pinterest! I was so impressed that I’ve chosen SuellaDaville’s pinboard as our winner! She wins a Deluxe PassPorter of her choice, two PassHolder Pouches, some extra PassPockets, a PassPorter Pin, and a $50 gift certificate in case there’s more she wants that we didn’t include! Congratulations, Susan — please e-mail me at jennifer (at) passporter [dot] com so I can send you your prize! I’d love to do another Pinterest contest! Before I settle on an idea, does anyone have ideas they’d like to share? Themes? Rules? Please reply here! Thanks for choosing me as a finalist (alt char). This was fun. I mostly do Pinterest contests so I’d love to see a different one on Pinterest – maybe around a specific character or maybe “Disney through the years”? Much appreciated.